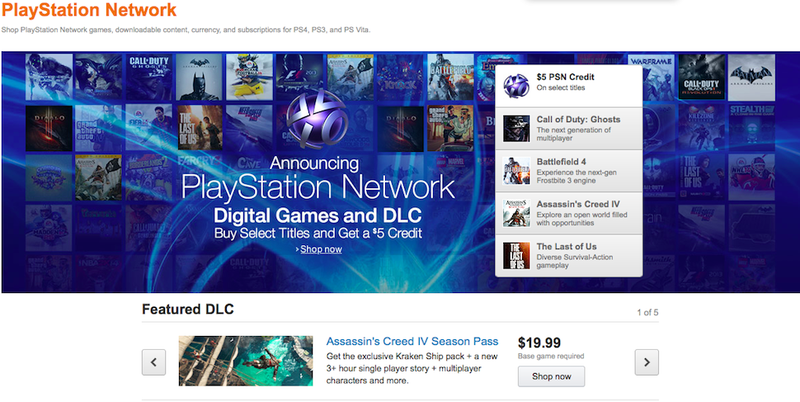 This is the new Amazon Playstation Network Store, an alternate venue to purchase digital Playstation content for Playstation 3, Playstation 4, and Playstation Vita. The downside of going all digital for the next-gen consoles was going to be restricting yourself to only one storefront for potential deals, but now that's not an issue. To celebrate the launch of the store, Amazon will be offering $5 PSN credit back on select digital purchases, and even better, customers who participate in the limited time buy two get one free promotion starting at noon ET today (Tuesday) will also get a bonus $5 PSN credit. We can't wait to see what digital deals Amazon brings to the PSN table, and we'll be back before the B2G1 free promo goes live to remind you again. Disclaimer: Due to some confusion caused by the wording of this post I want reiterate that the Commerce Team operates independently of Kotaku Editorial, and that Commerce Posts are not Sponsored. All Sponsored posts are tagged as such.